So, have you ever had one of those crafts that has a whole saga behind its creation? 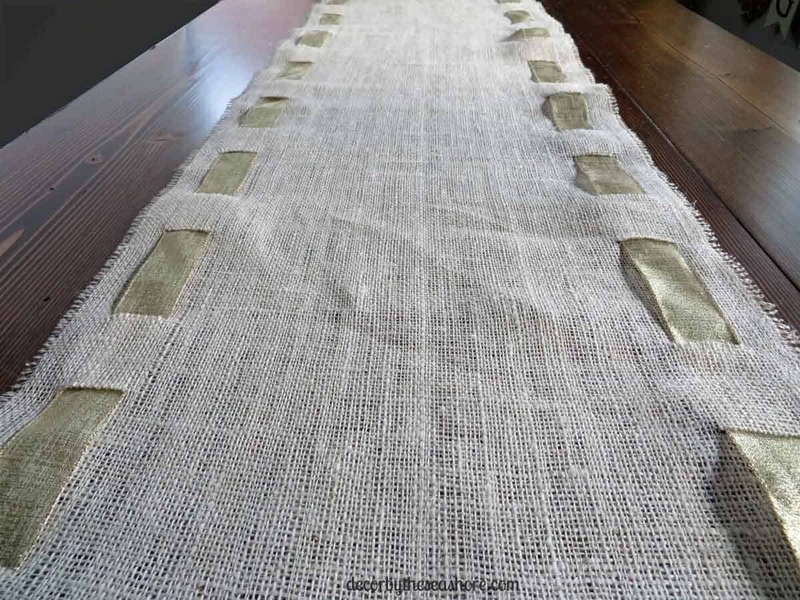 This DIY burlap table runner is one of those. I found this beautiful burlap with gold metallic dots that I am in love with, and I really really wanted to use it for my table runner! But it’s $15 a yard, and I just couldn’t justify spending $45 on burlap fabric for a table runner. So I decided to get plain burlap and use gold paint to put dots on it myself. I thought I’d save a ton of money and get the same look for less. So simple, right? Apparently not! Little did I know how incredibly difficult it was going to be to get that same metallic gold dot look from paint on burlap. I must have tried every gold metallic paint our local craft stores offered, but with no luck. Once I painted the metallic paint on the burlap, it just didn’t have that same metallic sheen. It always ended up looking copper or dark yellow, with nothing metallic about it. So when I was at the craft store for the tenth time, I found some shiny metallic ribbon and decided to forego the paint method and weave the ribbon through the burlap, which turned out wonderfully. I was originally disappointed my first idea didn’t pan out, but I am thrilled with the end result. Crafting lesson of the day: It might not turn out how you originally thought it would, but it could be even better! 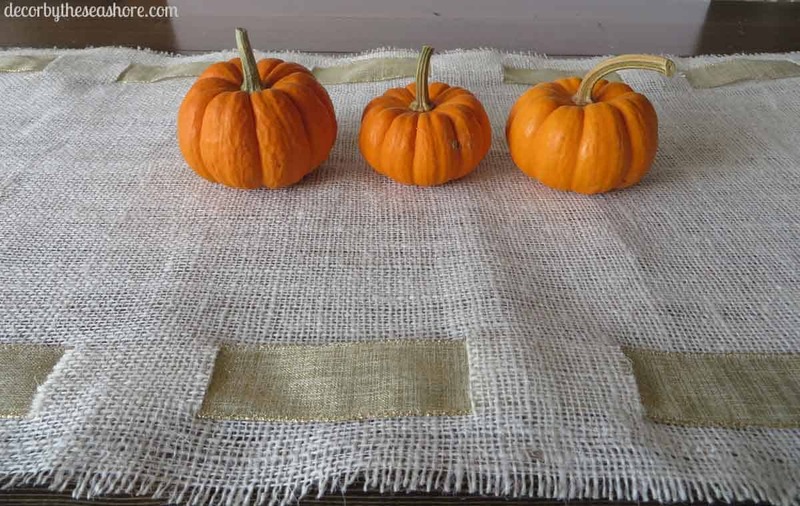 I love this DIY burlap table runner because it is perfect for any holiday. I used a gold metallic ribbon for Thanksgiving and Christmas, but you could also use some orange ribbon for Halloween, or some patriotic ribbon for the Fourth of July, etc. The options are endless! And if you really want to get creative, you can switch out the ribbon for different holidays, thus creating an interchangeable table runner! Did I mention how much I love making interchangeable holiday decor? 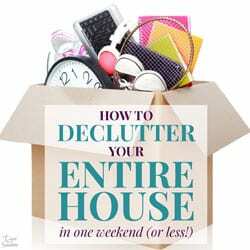 It saves so much time, money, and storage space. 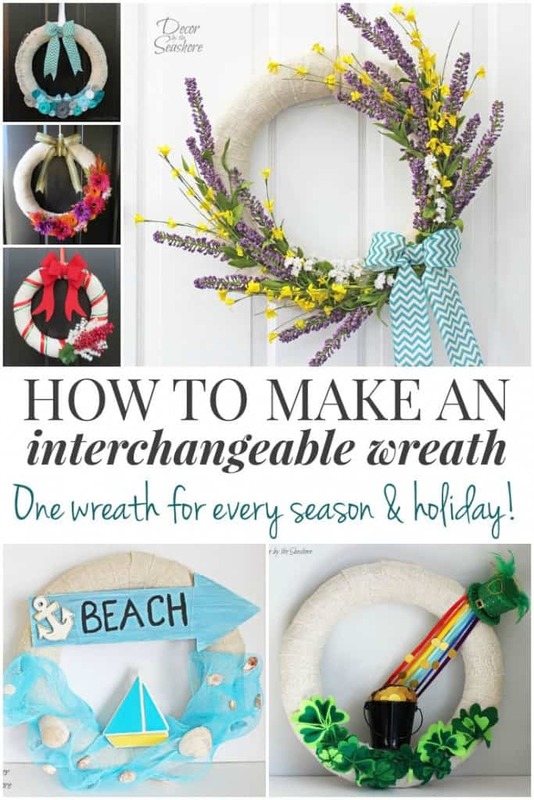 For more interchangeable holiday decor, check out my interchangeable wreath. It’s perfect for any holiday and season! 1. Measure your table to determine the size you want your table runner to be. To give you a guide for your measurements, I added 2 feet to the length of my table and divided the width of the table by 3. You can make yours shorter or longer or whatever size works for you and your table, that’s the beauty of DIY. 2. 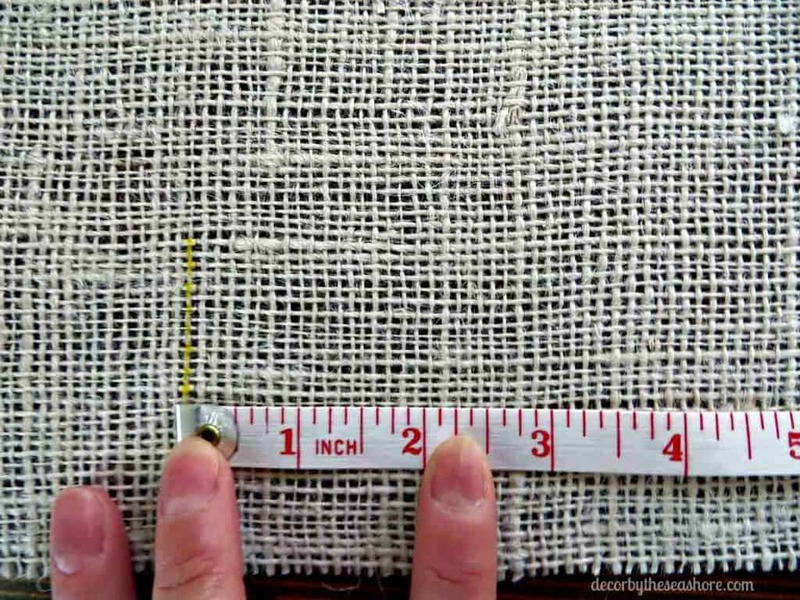 Cut your burlap to the size of the measurements you determined in Step 1. 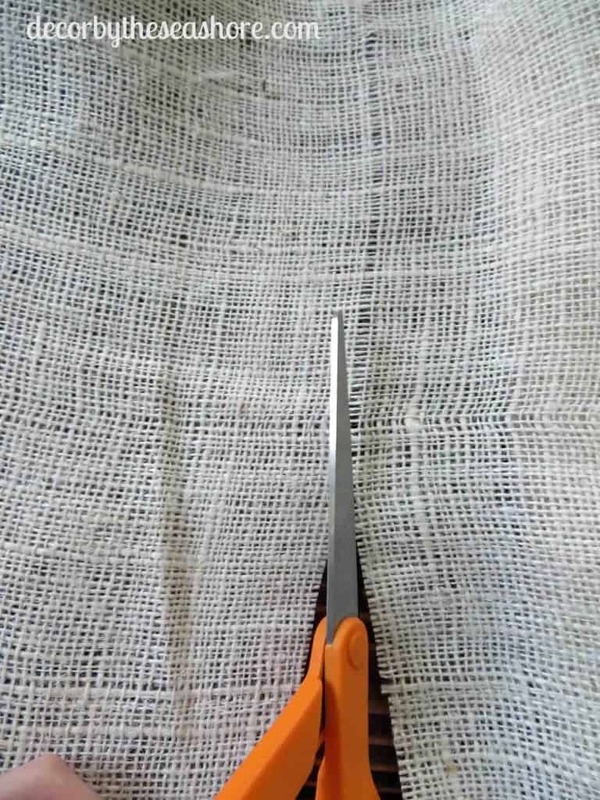 It is really important that you cut the burlap in straight, even lines, so check out my tutorial on how to cut burlap the right way to ensure you get a nice, straight cut for your table runner. 3. 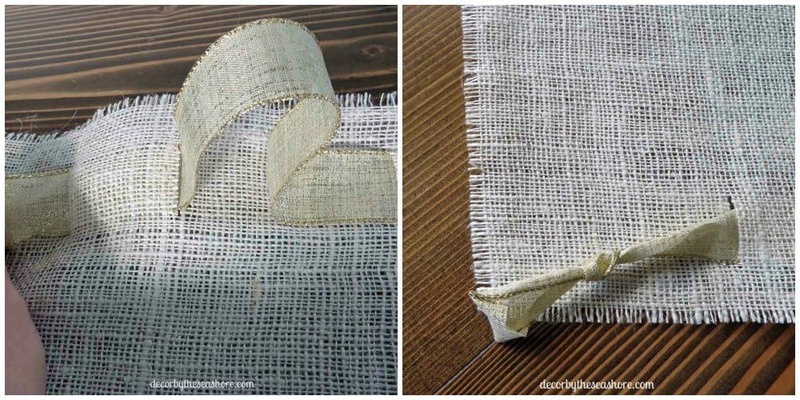 To add fringe to the edges of your table runner, carefully remove a few rows of burlap. I wanted my table runner to have a little fringe on the edges, so I removed about 3 rows of burlap from the edges. If you want more fringe, remove more rows of burlap. If you don’t want fringe, then just leave the edges alone. If you prefer finished edges on your table runner, you can forego the Fray Block and use iron-on adhesive tape or just sew the edges under. 4. 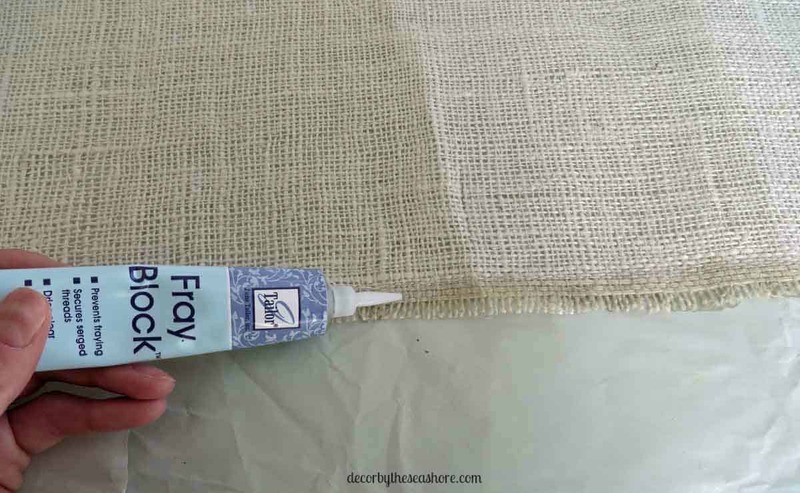 Follow the directions on the tube of your Fray Block (or whatever anti-fraying product you are using), and apply it to the edges of the burlap. This will help ensure more rows of burlap don’t come out on their own. Let it dry. 5. Measure and mark where you want to start your ribbon on the table runner. To give you an idea of placement, I ran my ribbon lengthwise about 1 inch from the edge and started it about 3 inches from the end of the burlap. Use your pen or marker to lightly draw a line the width of the ribbon at the end of the table runner. This is where you will make your first cut. 6. Cut a slit in the burlap along the line you drew. Be very careful to only cut the burlap strands that run lengthwise along your line. 7. 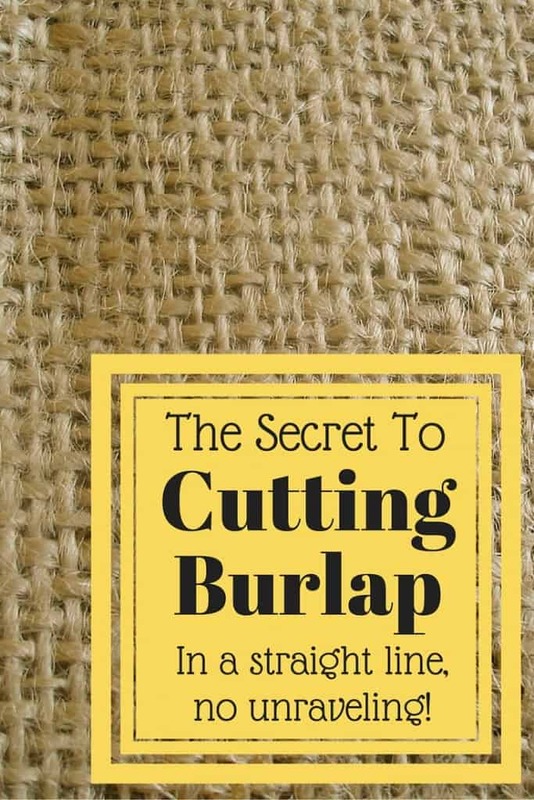 Use your tape measure to follow the line you cut and continue cutting slits in the burlap on the same strands. I spaced my cuts so my ribbon is on top of the burlap for 4 inches and underneath for 2.5 inches. It’s up to you how often you want your ribbon to be above and below the burlap. Cut the slits for the entire length of the table runner and then repeat this on the opposite side. 8. Cut 2 strands of ribbon as long as your table runner. 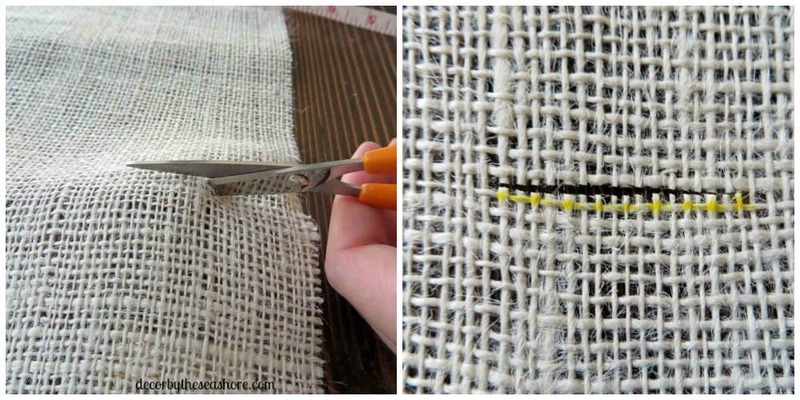 Carefully weave your ribbon through the slits you cut on both sides of the table runner. Tie a knot in the ends of the ribbon on the bottom side of the table runner to ensure they stay in place. 9. 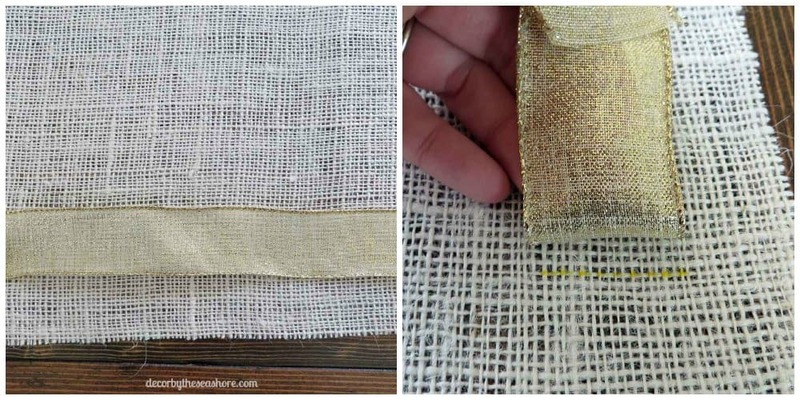 Place your DIY burlap table runner on your table and admire your handiwork! Isn’t she pretty? I just love the ribbon weaving through the table runner. 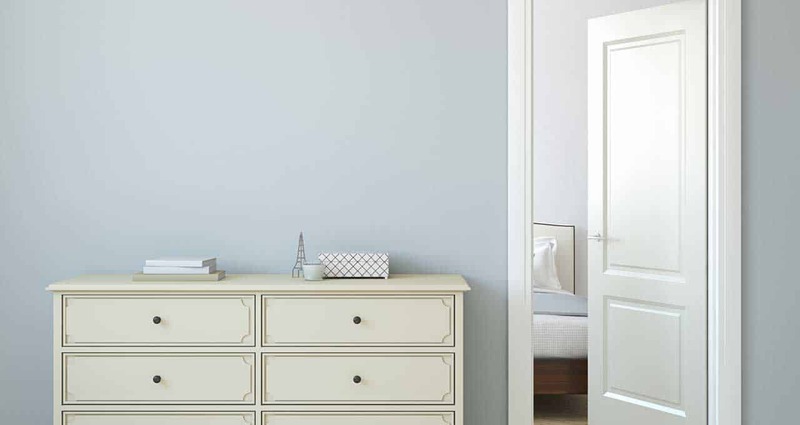 It is a wonderful shimmery metallic gold that picks up the light beautifully. And I love the fact that the gold ribbon is really appropriate for almost any holiday, but if I ever wanted to change it I could just pull the ribbon out and weave a new one through. Perfect! So tell me, what kind of table runner will be gracing your table this holiday? If you enjoyed this post, feel free to share it with friends and family. And don’t forget to sign up for my newsletter below to get my latest craft and home tips delivered right to your inbox! Celeste, I just came from my blog where I commented and said pretty much the same thing. It seems we are two peas in a pod. You don’t know where your project will take you. And yours certainly turned out better than you expected. It’s like it has a mind of its own, we are not in control, but the materials are leading us to the best result possible… Am I making any sense here? Your runner looks fantastic! And the fact that you can change out the ribbon is icing on the cake! Thanks, Mary! It’s true, good crafters think alike! I wasn’t sure how it would turn out when my original idea didn’t work out, but I suppose that’s the beauty of crafting. You can use all sorts of materials and techniques to create it in a different way. The end result might be even better than you imagined! Your table runner turned out beautifully, even without gold dots. The simplicity of the ribbon is just lovely, and, like you pointed out, it will work with many different table decorations and seasons. Thank you so much, Rebecca! I love it when a craft I thought wouldn’t turn out right ends up looking great. And I am a big fan of being able to use my holiday decor more than once a year! It is pretty! Another great project, Celeste! Thanks for sharing! This is beautiful. I just love burlap, and that ribbon on the edge is great! Thank you! I think the ribbon gives it a little extra pizzazz! Well, I think that the ribbon idea seems like it may have turned out better than the metallic gold dots. I really love this. I actually bought a burlap runner in the same color and have been struggling for an idea to make it a little more special than just plain burlap. This is awesome inspiration! Thank you! I’m so glad you found this helpful! 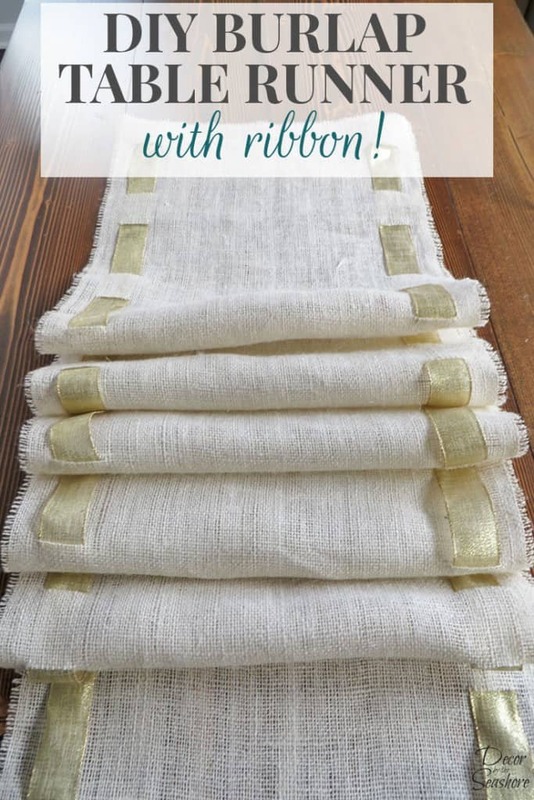 This would be the perfect way to add some pizzazz to a plain burlap table runner! This is beautiful! I have almost a full roll of red burlap and now I know what I’m going to do with it! Thank you! This would be great for your red burlap! It will make a fabulous table runner just in time for Christmas! I love how your table runner & diy turned out. Thanks for sharing your project at the Inspiration Spotlight Party. Pinned & shared. Thank you so much! I appreciate the shares! Your table runner turned out beautifully! 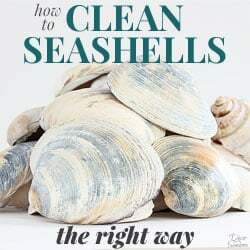 Great step by step instructions and pictures. I love the idea of being able to change out the ribbon. Thanks for sharing! Pinning! Thank you so much! I am glad you found the tutorial helpful! I love being able to easily change out my decor! I love me some gold on my thanksgiving table! Me too! I have been pretty obsessed with gold lately, as if you can’t tell, so it was a no-brainer when I picked the color! Lovely tutorial. I am using bleached burlap on my dining room chairs right now. A matching runner would be a great idea. Love the touch of bling. I like this better than the gold polka dot burlap (saw it) myself. Cheers. Thank you! This would match your chairs perfectly! And you know I am all about the (thrifty) bling! Great story, i can certainly relate! The best crafts are the ones that happen like this….thanks so much for sharing on craft schooling sunday! Yes, I love it when a craft turns out great even when it doesn’t go the way you originally planned! Gotta love burlap, can do so much with it. 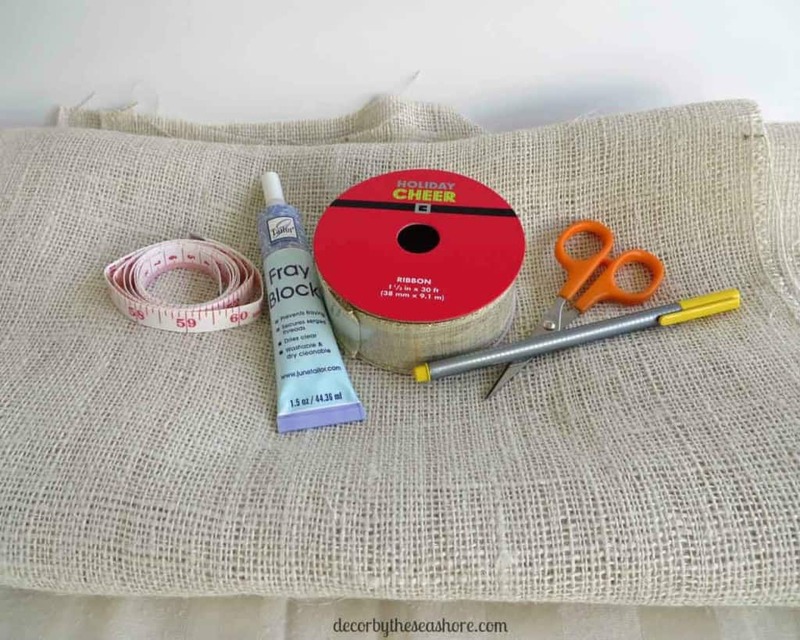 I had never used burlap until I found blogs. Luckily was introduced to how to cut burlap early in my venture with it. Love the price too and rustic look of it depending what you use with it. Your table runner is so pretty, love that ribbon. Have to ask you, did you use fray block on each side of your slits as you went down runner? Just wondered if burlap would fray at slits. When I started using burlap I hand sewed everything as was terrified of messing up my sewing machine. Later used the zigzag stitch on edges to stop the fraying as didn’t have any fray block. I have found I get general idea what I want to make but as project moves along it seems the project tells me what to do for best end results. I have made a determined plan as every time it gets changed as I go along and definitely turns out better in end, have learned to go by that premise when making things like table runner or pillow covers, for example. I am a very spontaneous crafter which has served me well in my life. I Love that ribbon you used, recognize it as some have purchased at Hobby Lobby on 1/2 off sales. I won’t buy ribbons or trims unless they’re on sale. Why pay more? Usually HL has ribbon 1/2 off at least twice a month so I do my buying accordingly. Hey my budget is living on SS so am careful to use coupons and watch sales in Sunday paper. 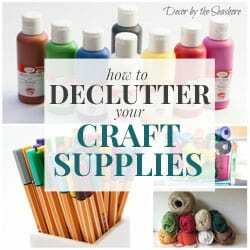 My hubs teases me that I’d buy craft supplies before I’d buy groceries, hmm where are my priorities? We don’t have a dining area but i make table runners for coffee table, kitchen island, tv stand. Love making them, can you imagine hand sewing ruffles on each end? Takes me while but it gets done and keeps me out of cookie jar. I have since used my sewing machine but actually think like hand sewing instead. You are so right, Janeellen! 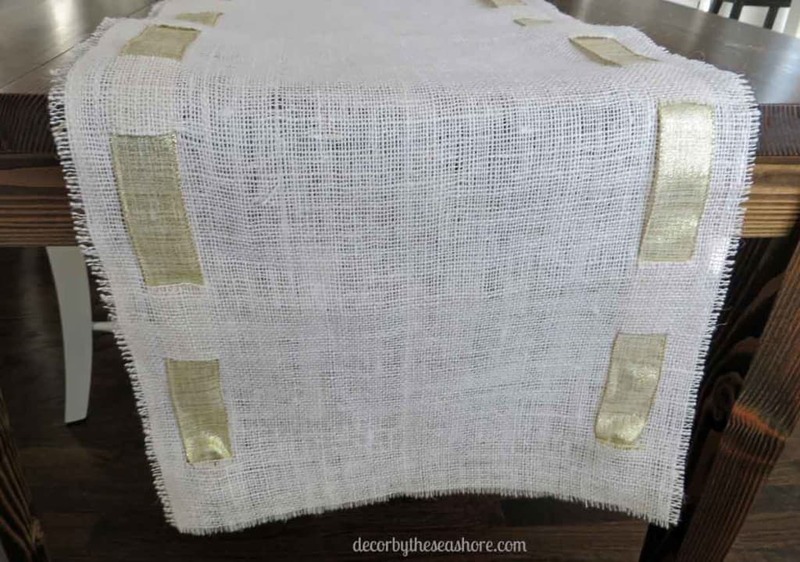 Burlap is a very fun fabric to craft with if you know how to work with it, and the price is fantastic! I think I spent $6 on my burlap for this table runner, and I still have a bunch left over for other crafts. Very economical! So I did experiment with Fray Block on a few of the slits. I only put a little bit though because I didn’t want to fuse the slits back together. It didn’t really seem to make that much of a difference, so I stopped using it on the slits and just used it on the edges so it wouldn’t run out. I found that as long as you are careful when weaving the ribbon through the slits, you shouldn’t have any fraying. And it can’t really unravel or go anywhere since it’s just a small slit. 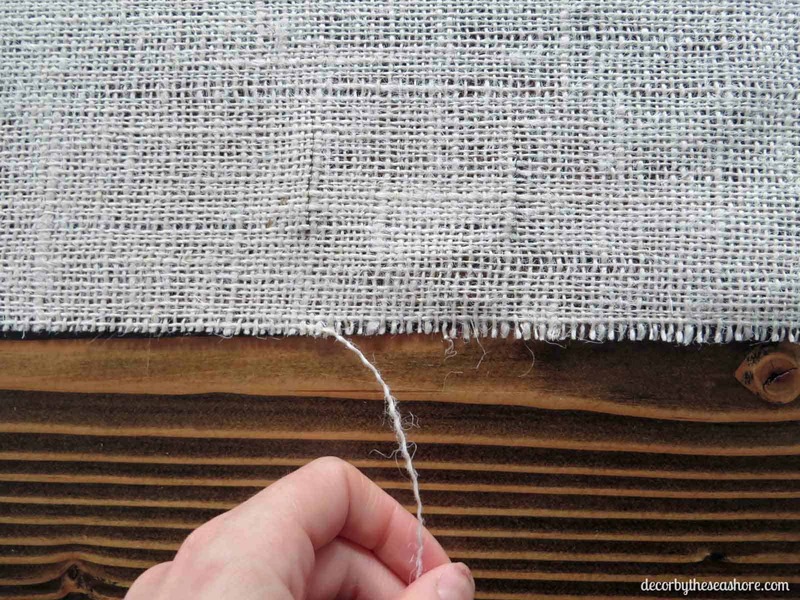 Zig zag stitching is another way you can keep burlap from unraveling, but you will need to give your machine a good cleaning when you’re done! My husband would probably also agree with yours… he thinks I’d buy craft supplies before groceries! Haha, I just tell him the only reason I go to the craft store before the grocery store is that I can’t leave the groceries in the car, of course! But really, I try to be frugal with my all of my craft purchases. Everything I buy at the craft store is either on sale or I have a coupon. 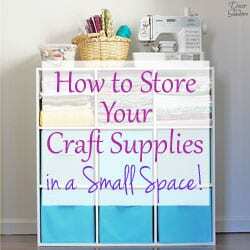 Almost all of the major craft stores have coupons you can find online, which helps save a lot of money! I really appreciate you taking the time to check out my blog. I hope you have a great Thanksgiving! This look gorgeous with the gold ribbon! 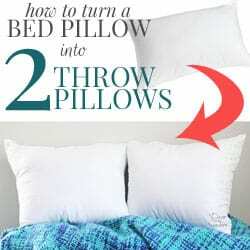 Such a great and inexpensive project! Just pinned it! Thanks so much for linking them up to my craft party!! Hope to see you this Thursday at 7pm EST. again! Thank you! I always enjoy linking up with you! I’m glad you found this helpful! Yes, Fray Block helps keep that burlap in check pretty well. Thanks for sharing! I love your table runner, Celeste! I have some burlap and would love to make something similar but I have some doubt, have you washed it yet? I’m asking because of the strands, do they loose? Thank you! I have not washed it since making it, but according to the instructions on the Fray Block, it is washable, so it should hold. I suppose worst case scenario, a few more rows of burlap come off the edges and you have a little more fringe! I would remove the ribbon before washing though so it doesn’t get twisted and misshapen. Hope you have a wonderful Thanksgiving! Happy Thanksgiving!! Thank you for sharing your post last week at our link party! I just wanted to let you know that I have chosen you as a feature for this week’s link party! Congratulations! The link party will start tomorrow at 9:00 a.m. EST so feel free to head on over there tomorrow, check out your feature, and grab a party button! Hope to see you there! Thank you so much! 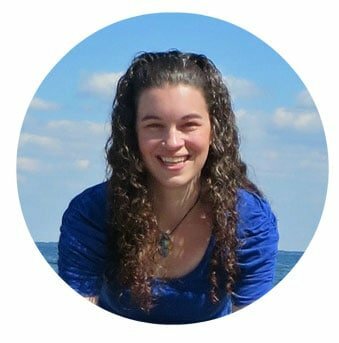 I’m thrilled to be featured on your blog! I will definitely stop by to check it out and link up again! Sherry, burlap can be difficult to work with sometimes, but you can make such beautiful crafts with it! I will be sure to check out your link up! I’ve had many projects that turn out better in my mind than they did when I actually went to do the project. I’m glad you went a different route with your project because it turned out beautifully!!! The ribbon through the burlap was a fantastic idea!!! 🙂 I love that it’s so versatile for any season!! Thanks, Keri! I am so happy with the way it turned out, too! 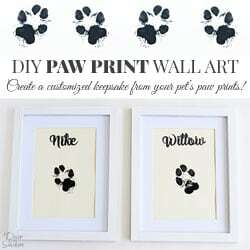 I always enjoy making crafts that can be used for all kinds of occasions! Your table runner is beautiful…maybe I can try out one. Have a great week ahead! Thank you! You should give it a try! 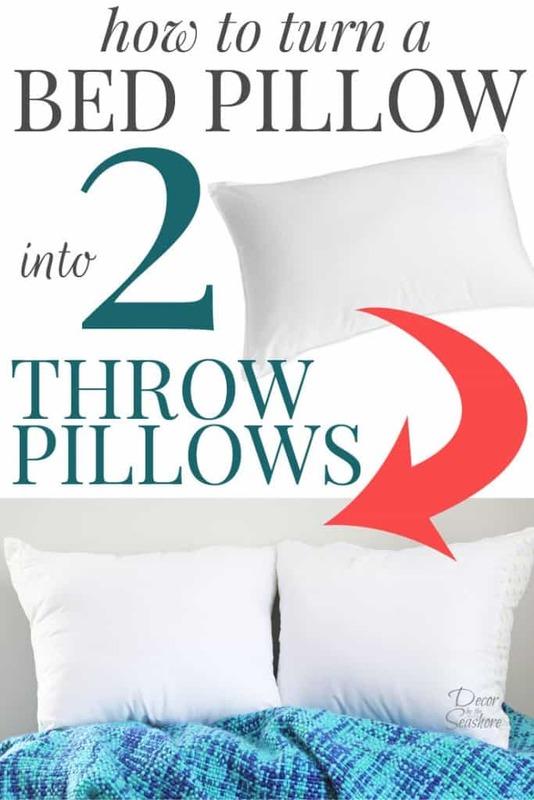 It’s really not hard, and it will be a beautiful addition to your holiday decor! Thank you so much, that is so sweet of you, Shantel! This came came out really pretty! I like the changing the ribbon idea too! Thanks for linking up to Merry Monday! Sharing on G+! Have a great week! Thank you! The ribbon accent really makes this table runner! I will definitely be back for your link up again next week! Love your table runner. How can you go wrong with burlap. Thanks so much, Beverly! You really can’t go wrong with burlap, can you?